New GardenSmart contributor Tommy C. Simmons is a Southern food, entertaining, gardening, and arts enthusiast. She (Yes, Tommy is female. She was named for an uncle who was killed in World War II) is a national award-winning food writer/editor who retired in 2011 from The (Baton Rouge, LA) Advocate newspaper’s food editor position and now resides in the north Georgia mountains. Simmons is a member of the James Beard Foundation, the Association of Food Journalists, and the National Federation of Press Women. When chefs in the 1970s started introducing bolder-flavored salads, full plate dishes heaped with fresh spinach and bitter greens, sautéed pears and apples, exotic vegetables, roasted nuts, and shavings of imported cheeses, customers were eager to try these new creations. Diners liked the interesting salads with the new tastes and ingredients and by the end of the ‘70s decade home cooks were making entrée salads at home and for ladies’ salad luncheons. Today, salads are the most popular side ordered at restaurants and it’s not unusual for a woman to order a meat- or seafood-studded salad as her entrée. In the 1980s, a variation of the full plate salad, the Strawberry/Green Salad, was an immediate hit with Southerners. Strawberries were available in the Deep South in early January, sometimes even late December, and were a colorful, sweet/tart tasting substitute for tomatoes. Plus, the berries paired well with winter greens, spinach, red leaf lettuce, arugula, romaine, etc. You-pick fruit farms and orchards that started opening up around the country about the same time also promoted recipes for strawberry salads. Strawberries sold in most supermarkets are sweet tasting and plump in size, so if your own patch of strawberries hasn’t produced ripe fruit just yet, don’t feel badly about substituting the store-bought berries for your homegrown fruit. You don’t want to put off making this salad because the fruit pairs so well with the greens and fresh broccoli, both of which are in season right now. If using store-bought berries, cooks should slice the large berries before combining with greens. A 16-ounce container of strawberries will provide ample berries for a large salad to serve 8 to 10 as a side. 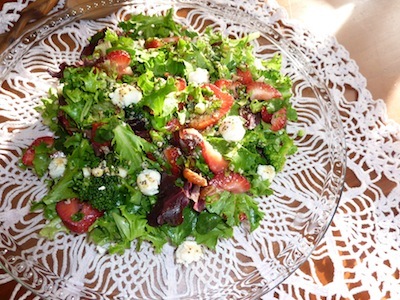 I have two Strawberry/Green Salad recipes I make again and again. The first I vary as suits my mood so I’ll provide the recipe in its original version and include a note of my favorite additions or substitutions. The second is just as wonderful tasting and uses romaine, a sturdy salad green. Prepare salad dressing by combining the sugar, poppy seeds, sesame seeds, onion, paprika, vinegars, and oils. Set aside. Sauté almonds in melted butter over medium heat until toasted. Set aside. Testing note: Add 1 cup steamed, drained and cooled chopped fresh broccoli florets for additional texture and vitamins. Can substitute chopped pecans for almonds, if desired. And balls of fresh mozzarella also compliment the sweet/tart dressing, greens, and berries. For the salad: Combine almonds and sugar in a saucepan, cook over medium heat for 10 minutes or until sugar melts and almonds turn golden brown, stirring constantly. Cook for 2 to 3 minutes longer. Spread almonds on a sheet of foil. Let stand until cool. To make dressing: Combine oil, sugar, apple cider vinegar, balsamic vinegar, onion and dry mustard in a food processor and process until well mixed. Combine romaine, cheese, strawberries, and almonds in a bowl. Add dressing and toss to coat. May be prepared one day in advance and refrigerated.